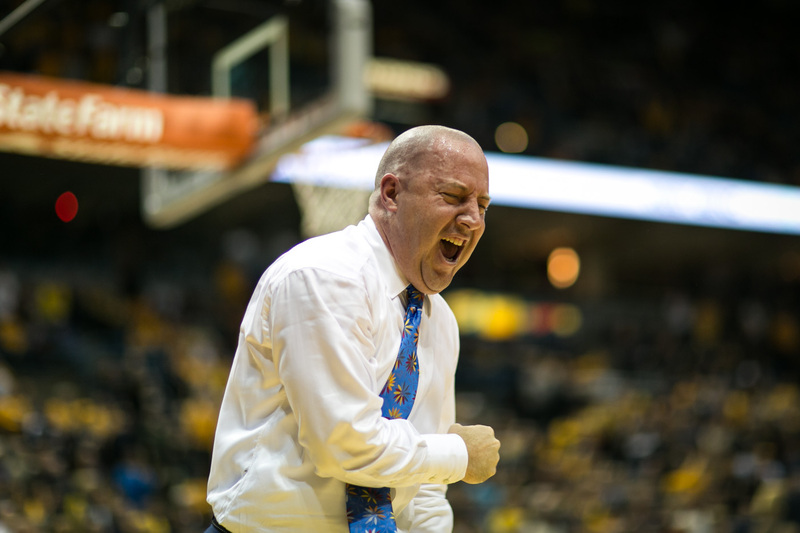 Buzz Williams may have tried to change, but he’s gone back to what works. This season was supposed to be a changing of the guard at Marquette, literally. Gone was the Golden Eagles’ backcourt from a year ago — Junior Cadougan, Vander Blue and Trent Lockett — that made up 44 percent of the team’s scoring, 53 percent of the assists and 46 percent of the 3-point makes. The top freshman Williams thought he’d have at his disposal — Duane Wilson — suffered a stress fracture in October, and even T.J. Taylor figured to be part of the mix, but the junior-college combo guard transferred in 2012 after eight weeks on campus. Jamal Ferguson, too, transferred following the 2012-13 season after discovering his limitations as a high Division I athlete. So, for the first time since Williams was introduced as head coach in April 2008, the Golden Eagles became big. 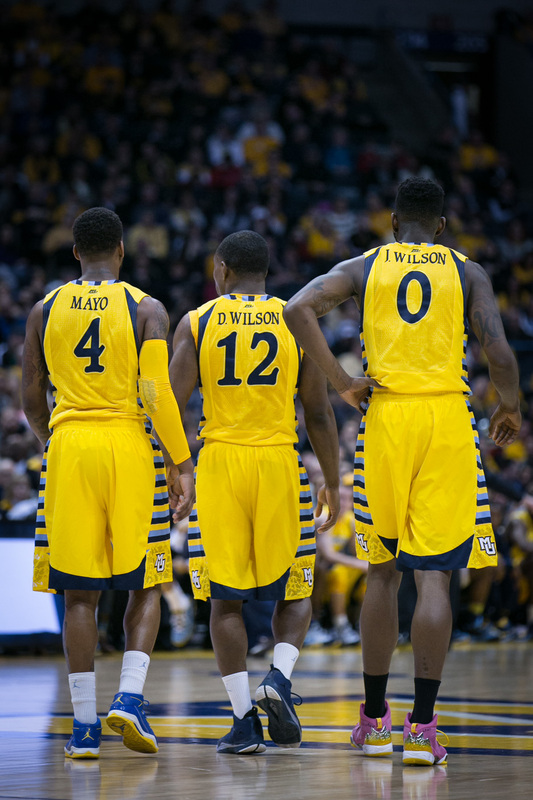 Led by sixth-year senior Chris Otule, fifth-year senior Jamil Wilson and fourth-year senior Davante Gardner, Marquette was expected to have one of the better frontcourts in the country, odd as it was to consider. Even with Jameel McKay inexplicably leaving the team right after Marquette Madness, depth was still available. Juan Anderson had returned to the team after asking for his release in the summer, and Steve Taylor Jr., while recovering from setbacks from knee surgery, was assumed to be a contributor in some form, if not a large form in the wake of McKay’s departure. No longer did Williams have at his disposal in the backcourt the Three Amigos, an Acker/Cubillan/Johnson-Odom sharpshooting trio, trusted, heady players in Junior Cadougan and Trent Lockett or the star power of a Vander Blue — even though he transformed into a star his junior season, it didn’t come as much of a shock from the former five-star recruit who had shown flashes of stardom as a sophomore. Marquette is getting back to what works for them. The Golden Eagles weren’t barren in the backcourt. Derrick Wilson essentially was the same player Junior Cadougan was and had two years of work as an understudy to the Canadian to learn the role. There was Jake Thomas and Todd Mayo at the two-guard, with Jajuan Johnson — who had drawn rave reviews during Boot Camp from just about everyone being interviewed at Media Day — filling the role of x-factor for a team that, because of its size upfront, didn’t require a plethora of depth in the backcourt. It was seen as good enough, filling in where needed when the dominant frontcourt required help, and a bonus whenever both sides played well. The combination of any two forwards and Gardner/Otule looked great on paper, and the size of the frontcourt was a sight to behold for a team that, three years earlier, had 6-foot-5 Lazar Hayward manning the center position against the likes of Georgetown’s Greg Monroe. But it wasn’t yielding results. The documented offensive struggles were apparent for a group that began 5-4, then moved to just 7-5 and was embarrassed in their “new” Big East opener at Creighton, scoring a mere 49 points. Juan Anderson and Deonte Burton saw minutes sprinkled in a lineup that was “bigger” more than it was “smaller.” Those substitutions helped a defense that was always there, ranking at best in the teens in terms of defensive efficiency. But even the solid defensive marks weren’t leading them to victory. They needed a jolt. They needed to go back to what was working. Marquette has won its last three games — its first three-game winning streak of the season, no less — in part by implementing a three-guard lineup that’s dominating. A new feature implemented by KenPom.com documents the 10 lineups used most by teams the past five games. It’s a great look at how often teams rely on certain groups of players, and Williams’ hockey-like line change substitutions make Marquette one of the most interesting teams to break down. Its most used lineup has been Derrick Wilson, Todd Mayo, Jake Thomas, Jamil Wilson and Davante Gardner. It’s not all that surprising, considering those five players lead the Golden Eagles in minutes per game, but the frequency in which it’s been used is. That lineup the past five games has been on the floor 22.9 percent of the time, or roughly 46 of 200 possible minutes. Pomeroy’s calculations end at the minutes, though; there are no statistics to go with it, which is where Paint Touches’ pen, paper and handy dandy calculator come into play. And the numbers don’t lie: this lineup is winning. In Marquette’s past three wins, that five-man lineup has played 33:23 of 120 possible minutes, or 27.7 percent of the time. That’s up nearly five percent from the five-game average, and means that Williams used the lineup roughly 13 combined minutes against Providence and the St. John’s debacle (16.2 percent). That would still be the most frequently used lineup, but Williams has gone to it more during the three-game win streak. These numbers shouldn’t come as all that surprising. Mayo’s recent hot streak, combined with Jamil Wilson’s and Davante Gardner’s offensive skill set make this arguably the Golden Eagles’ optimal offensive lineup. Even Thomas has helped the cause, scoring 29 points in the span with just three turnovers in 80 minutes; he may not be shooting efficiently, but he’s got Williams’ blessing to stay on the court because he makes the right decision more times than not, and knows the offense. And it makes sense that Williams has used this offense lately. The three-game stretch came on the heels of Marquette’s disastrous 59-point outing at Madison Square Garden in which they shot 35 percent, committed 16 turnovers and missed 11 of 14 3-pointers against the Red Storm. Had it not been for the 21 offensive rebounds it gathered, the score likely would have been much worse. So Williams went back to the offensive lineup that worked, letting Mayo off his leash — he’s played 88 minutes the last three games after playing 77 minutes the four games prior — and using that three-guard lineup that helped him to two Sweet 16s and an Elite Eight. The offensive peak of this lineup occurred against Seton Hall. Midway through the second half Williams subbed in Jamil Wilson, Gardner and Thomas with Marquette trailing 56-52. That was the last substitution he made all game — at the 9:22 mark — and it was all he needed to do; the Golden Eagles scored 25 points on their last 17 possessions, going 6-for-10 from the field and knocking down 8 of 10 free throws to close out the game. Four of those players scored before the free throw frenzy (Thomas didn’t shoot), giving Marquette balance rarely seen this year on the offensive end that resulted in a key road victory. There may be an argument for freshman Deonte Burton to see more minutes, but if Williams is intent on staying with a three-guard lineup Burton would have to take out Gardner or Jamil Wilson, which wouldn’t make much sense. It’s worth noting, however, that Burton shows up in Marquette’s third most frequent offense as the “4” with Derrick Wilson/Mayo/Thomas in a three-guard set, and Chris Otule as the center. But there’s that pesky other end of the floor. Marquette’s defensive efficiency ranks 40th in the country, including third in the Big East in conference play, and a large part of that has been the play of Chris Otule, Jamil Wilson in a “bigger” role and even John Dawson, who has been an above average defender in his freshman season. But Williams hasn’t simply been playing the lineup game against his last three opponents. According to Pomeroy, Butler, Seton Hall and Xavier all use a lineup most frequently that consists of a player 6-foot-6 or taller at the “three.” In other words, those teams’ most frequent lineup isn’t a three-guard set, so Williams isn’t necessarily trying to match up on the defensive end. There certainly are more factors to take into account, but this five-man lineup has defended extraordinarily well. Opponents are shooting just 42 percent from the field, averaging a mere 0.82 points per possessions and turning the ball over at a higher rate than when that five isn’t on the floor. It’s actually quite nerve-wracking that opponents are shooting better than 54 percent when this lineup isn’t on the floor, perhaps most for a player such as Otule. These numbers don’t necessarily say much about any of the five individuals — an “other” lineup could constitute as many as four of the players and a different fifth — but there’s a certain comfort when the most frequent five are on the floor. It should make sense, considering those five have played together for three seasons and are made up of three seniors and two experienced juniors. The best defensive stand of the three-game stretch came against Xavier. In the second half, Williams used the lineup for 4:38 and in eight possessions turned the Musketeers over four times and allowed five points on 2-for-5 shooting. An eight-point lead (59-51) became a 13-point lead (69-56) by the under-8 media timeout, completely swinging momentum at a crucial time that wound up meaning a lot when Xavier made a late run. In the 33-plus minutes this group has played together, they’ve outscored their opponent, 82-53. That +29 rating is far better than when the lineup isn’t in the game; in fact, Marquette has been outscored 147-145 when all other lineups are on the court. That specific lineup was +4 in a seven-point win over Butler; they were +11 in an 11-point win over Seton Hall and +14 in a nine-point win over Xavier. Williams has put this lineup out 19 different times the past three games, and only four times has it been outscored. For years Marquette has run on a three-guard lineup. Many expected that would change in 2013-14. The personnel said it would, and Williams has been uncanny in his ability to play to his roster, rather than making those players conform. But when push came to shove and the Golden Eagles needed to begin producing, he went back to what he knew best. The D. Wilson/Mayo/Thomas lineup is what Williams was built on — three guards, including two wing scorers — plus a pair of versatile frontcourt scorers. The defense has been an added bonus (it’s time to stop saying Jake Thomas doesn’t do anything defensively) and, as a whole, it’s the main reason Marquette is winning. With the home game of the year on tap, tomorrow’s bout vs. Creighton, it’s shaping up nicely that this lineup is working out. The Bluejays love to go small, with their top two lineups (almost 34 percent of their total lineups) comprised of a guard at the “3.” Marquette is playing well as a whole, and it’s even better when that group of five is in the game. Watch carefully the rest of the year when they’re all in together. There’s a good chance they’ll be playing well with a lineup that looks like Marquette.